France has a rich history of great art and artists. Many of the most famous painters in the world lived and worked in France, coming from near and far to be inspired by the unique light, space and scenery. We’ve compiled a list of five places in France you might like to visit to follow in the footsteps of renowned artists and see some of their great works of art for yourself. The historic city of Collioure has long been a source of inspiration for artists and is sometimes referred to as ‘The City of Painters’. The special quality of the light and the picturesque Catalan harbour have attracted the likes of Picasso, Matisse, Derain, Dufy, Dali, Marquet and Chagall to visit and capture the local atmosphere on canvas. The most important artists for the city are undoubtably Matisse and Derain. Together they were responsible for the Fauvism art movement that started here in 1905 and went on to influence a generation of artists. Matisse first came to Collioure in May 1905. He was 36 years old, depressed and running out of money. Arriving in Collioure Matisse suddenly felt a renewed enthusiasm for painting – he was energised and re-invigorated by the vibrant light and colour and bustling atmosphere at the port. He sent a postcard telling his friend Andre Derrain to join him in Collioure and the two artists began a frenzy of creativity, spurring each other on and painting Collioure from every angle. Their colourful canvases were exhibited in Paris and denounced by critics used to more refined work as ‘fauves’ which means ‘wild beasts!’ giving rise to the name of the Fauvism movement. 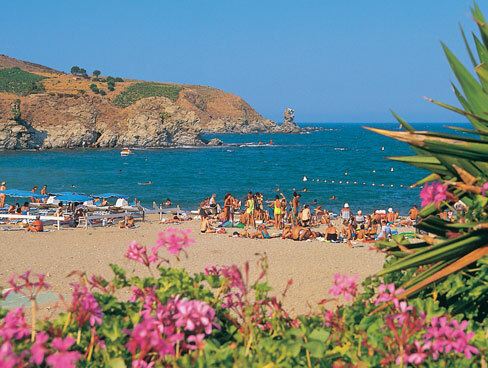 Today you can follow in the artists’ footsteps by taking a guided walk around Collioure where you can see strategically placed copies of some of the most famous paintings by Matisse and Derrain, positioned exactly where they were originally painted. “The way of Fauvism” is a fascinating tour that allows you to compare the views with contrasting paintings created by two great artists working side by side. There are 20 sites to discover on the tour giving you a real insight into the emotion and talent of these groundbreaking artists. Another art tour in Collioure is “Portraits of the Steeple”. This clever installation uses 12 metal frames to frame different views of the church tower Notre-Dame-des-Anges. It illustrates the richness of Collioure from an artists’ point-of-view – every different position and angle offers another inspiring opportunity to paint. 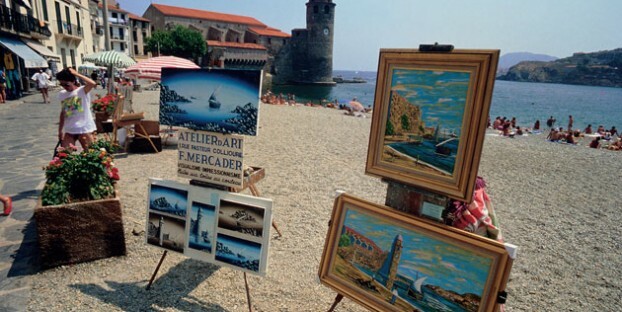 Collioure is still a mecca for artists today and the local galleries and art museum offer a wealth of different art to discover and buy. 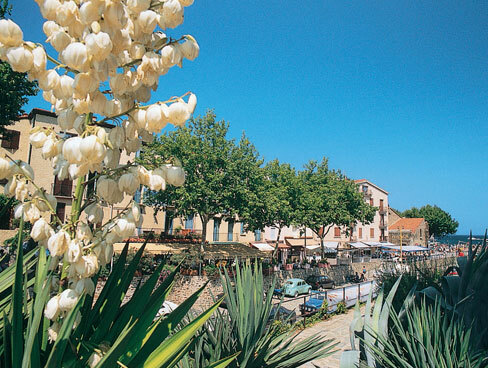 Arles features as an important location in the life of Van Gogh, one of the world’s most famous artists. He moved south to Arles from Paris in the late 1880s hoping to found a school of art, but the mental instability that blighted his life was already becoming evident. His friend Gauguin joined Van Gogh in Arles for a time but the infamous row that resulted in Van Gogh cutting off part of his own ear meant Gauguin left abruptly at the end of 1888 while Van Gogh was sent to an asylum in Saint-Remy. By the following May he was well enough to leave the asylum and move to Auvers-sur-Oise under the care of his doctor. Sadly, just two months later, he shot himself and died “for the good of all”. He could hardly have imagined the success and admiration his works now enjoy, having sold just one painting in his entire lifetime. The Arles visitor center offers walking maps that take in ten sites across the city where you can see reproductions of famous works by Van Gogh on easels positioned where they were originally painted. Many of the features remain the same as they were in Van Gogh’s day including cafés, hospital gardens, the Rhone River and the Langlois Bridge clearly depicted in his paintings. Take a trip to nearby Saint-Remy-de-Provence to take a tour of the asylum of St. Paul de Mausole where Van Gogh convalesced for a year, painting the view of the fields from his window. Auvers-sur-Oise has several significant sites that inspired Van Gogh’s final paintings including village streets, the Auvers town hall, Dr Gachet’s gardens, the gothic church and Chateau Auvers. Dr Gachet’s house is now a museum honouring the artist and the Chateau offers multimedia tours of the “Voyage au temps des Impressionistes”. You can also visit Van Gogh’s final home the Ravoux Inn (now known as ‘Le Maison de Van Gogh’). You can see the small upstairs room where he lived his final weeks and the ultimate scene of his suicide. The restaurant at the inn reflects the food of Van Gogh’s era and his room is presented frozen in time as it was when he stayed here. Van Gogh’s final resting place is marked with an unassuming gravestone at the back of the Auvers cemetery. Brittany provided the inspiration that allowed Paul Gauguin to move away from the impressionist movement and create his own signature style. Clear lines and bold colours reflecting the savageness of the sea and wild landscape in southern Brittany emerged in Gauguin’s works producing some of his most important pieces. He wrote “I love Brittany, I find a certain wildness and primitiveness here…a powerful tone I seek in my painting”. Gauguin first came to Brittany escaping from the turmoil of the Arles situation that led to his friend Van Gogh cutting off his own ear. He spent time in Paris but was attracted to the cheap, out-of-the-way town of Pont-Aven in Brittany with its established community of impoverished artists. His arrival caused uproar as he held court in the taverns and cafes inspiring some and irritating others with his strong ideas and strident style. 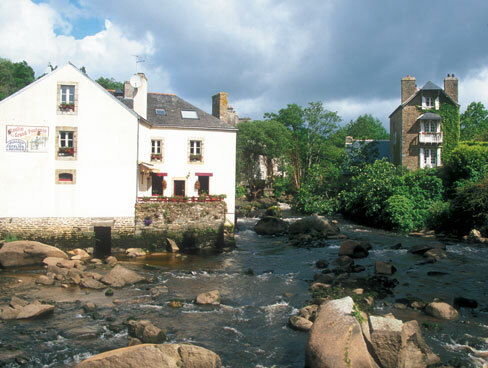 Gauguin’s paintings captured landscapes, girls in traditional Breton dress and rural life in Pont Aven and the nearby seaside fishing village of Pouldu, and there are many sites you can still see today to get an insight into his life and creativity whilst here in Brittany. His lodgings at a boarding house in Pont-Aven are still standing but the building, somewhat appropriately, now forms part of the School of Contemporary Art so you can only see his 3rd floor window from the street. The Musee des Beaux-Arts holds a small collection of Gauguin originals and you can follow a trail along the Bois d’Amour River where plaques mark out the sites where he painted landscapes and local washerwomen at work. The isolated Tremalo Chapel that inspired Gauguin is now only used once a year but is usually unlocked for any interested visitors to take a look. 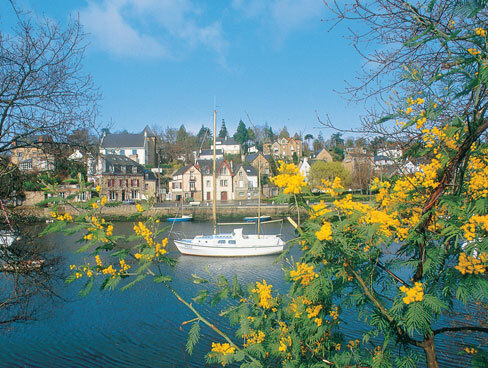 A short drive from Pont-Aven is Pouldu, Gauguin stayed here at Hotel Destais before moving to an inn called La Buvette de la Plage. The inn was destroyed but an accurate replica has been built in its stead as a museum. It has recreations of the wall paintings Gauguin did decorating the dining room, and restored bedrooms showing where he and fellow artist Jacob Meyer de Haan stayed. A cliff walk signed from the museum is punctuated with signboards marking the landscapes and scenes of peasant life painted by Gauguin. The Impressionist movement began in Normandy with artists like Eugene Boudin and Claude Monet. Many of the Impressionist artists were found here in the seaside resorts of Deauville, Dieppe, Honfleur and Le Havre; areas becoming popular with Parisian artists looking for a coastal retreat to inspire their paintings. Monet was the leader of the Impressionists and his style has influenced what we now see as modern painting. His landscapes and scenes of local life captured here have become well known throughout the world and have inspired and influenced future generations of artists. Monet’s house in Giverny is a major tourist attraction. The gardens still have the famous water lily ponds he so cleverly captured on canvas. Monet moved here in 1883 with his family and built up a groundbreaking artistic community. He lived at the house until his death in 1926 with many of his paintings inspired by the beautiful landscaped gardens as they changed through the seasons. The house and gardens are open to the public and Giverny also has a Museum of Impressionism that documents the work of Monet’s artist community and is well worth a visit. Normandy is full of sites that inspired Monet’s works including the Cathedral at Rouen, the cliff formations at Etretat, the port at Fecamp and the Seine bay at Honfleur that gave the name “Estuary Painters” to a group of artists that included Monet, Pissaro, Boudin and Renoir who prolifically painted the seascapes and scenes from the promontory above the bay. The local Boudin Museum displays some of the work created here. Le Havre was a chic seaside resort in the 19th century and many artists including Monet were drawn here to capture the changing light and colour in their paintings. 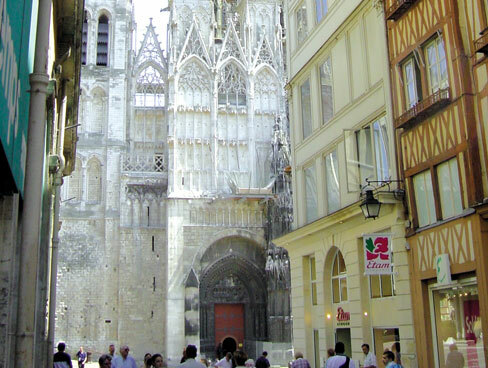 Today you can see the fruits of their labour at the Malraux Museum and Rouen’s Fine Arts Museum. No list of art destinations in France would be complete without a mention of The Louvre art gallery in Paris. The history of the building itself stretches back to the 12th century and it was first opened as a gallery in 1793 with a chaotic display of around 700 pieces and a community of privileged artists in residence. Today the Louvre is the most visited museum in the world welcoming around 15,000 visitors each day and housing over 380,000 paintings and pieces of art of which over 35,000 are on display to the public. The famous pieces on display include The Mona Lisa by Da Vinci, the Venus de Milo and other works by Da Vinci, Delacroix, Caravaggio, Brueghel, Raphael, Rembrandt, Renoir and Titian. It’s a must-see for art lovers and you’ll need more than one visit to properly explore all the Louvre has to offer.